Films which concern themselves with America’s involvement in Iraq and/or Afghanistan don’t often tend to reach a very large audience. While The Hurt Locker may have won Best Picture and Best Director in 2010, it barely made $50 million worldwide. Green Zone and Jarhead were ignored on nearly all fronts. Richard Linklater’s Last Flag Flying takes a different approach to telling a story concerning the Iraq War with a more intimate slant as to the effect of the war back on the home front. It too has underperformed at the box-office in America, which is a shame as this stands as one of the more intriguing, relatable and down-to-Earth meditations of America’s involvement in the Iraq War. Set in 2003, the film follows Larry ‘Doc’ Shepherd (Steve Carell) who heads out to reconnect with two of his buddies from Vietnam, Sal (Bryan Cranston) who owns his own bar, and Richard (Laurence Fishburne) who has become a Pastor. The reason for this long delayed reconnection: Larry’s son has just been killed in action in Iraq and Larry would like his old war-time friends to be there when he buries his son. 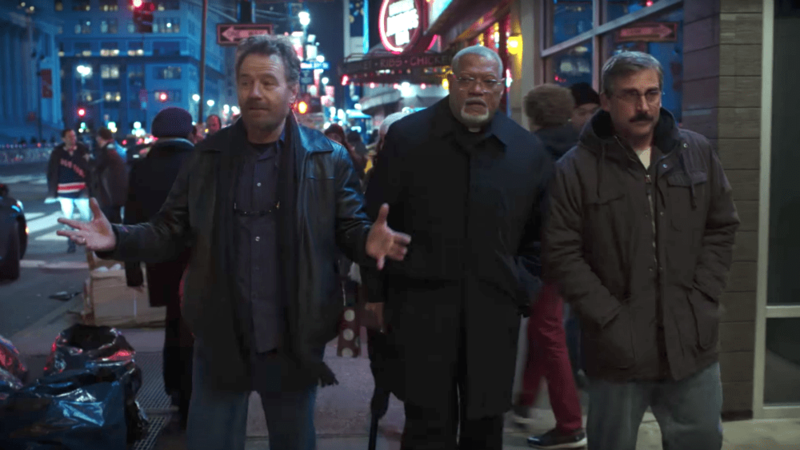 Last Flag Flying, which has been billed as a sort-of-but-not-really-sequel to The Last Detail (both are based on books by Darryl Ponicsan), may not seem like the most obvious choice for the director best known for his ‘slacker’ dramedies, but once the film kicks into road-trip mode, it’s easy to why Linklater was drawn to it. Especially as it’s a film largely comprised of scenes of men talking to each other about everything from sports to religion, middle-age woes and techno-phobia. And no one does scenes like that quite as well as Linklater can. With Carrell, Cranston and Fishburne all in exceptional form, Linklater gets into the rhythms of his character study, be it via train or car, in a confident and engaging fashion. A strong sense of melancholy and disillusionment runs through Last Flag Flying as the three men address both the nature of the war that Larry’s son has died for, as well as their own actions in the similarly misguided conflict that they all fought in 30 years prior. It is close to being an anti-war movie, without being too preachy about it. Instead, Linklater seems more interested in developing a story about grief, namely the grief of the parents who have had to see their children go off to war. This is largely conveyed in Carell’s touching performance, aptly portraying the feelings of a man who is doing his best to reconcile with the searing loss and pain that he has been dealt. Cranston and Fishburne are the more talkative foils to Carell’s soft-spoken Larry, giving the film a great deal of pep and energy, revelling in the camaraderie and well-formed banter within Linklater’s script. There are scenes (one scene in particular in the cargo hold of a train) that ring with so much genuine connection, humour and kinship that you’ll find yourself forgiving much of Last Flag Flying’s shortcomings. Every now again, a treacly sentimentality threatens to seep into the proceedings, something which is very much the case across the final act. A scene in which the three men go to visit the mother of a friend who died in Vietnam threatens to cheapen the film’s approach, but for the most part, the movie is an understated affair. The same can be said for the final moments of the film, as the ending delivers a message which feels at odds with the more inquisitive nature the narrative has towards the US government and its military actions. 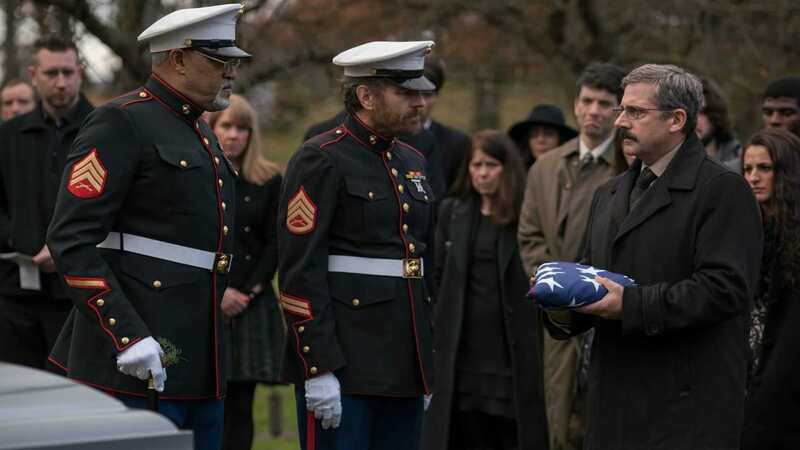 Last Flag Flying is a more successful rumination on grief than it is anything else. Its approach to patriotism feels a little muddled at times, but it is in its depiction of Larry’s grief and the means by which he aims to combat it that the film really connects on a level that feels both raw and personable, thanks to the easy-going chemistry between the three leads. Fans of Linklater will find much to adore in this impeccably cast film, one which explores patriotism and grief with a sometimes cynical, sometimes sentimental, and often hilarious lens, all delivered by a director who is quite happy to let talented actors do their thing while the camera rolls.